It’s widely accepted that schools segregated by race and socioeconomic status create unequal opportunities. But a new book by sociologist Jessica Calarco shows there’s more to the story – and suggests that giving all students a fair shot may be more challenging than we thought. 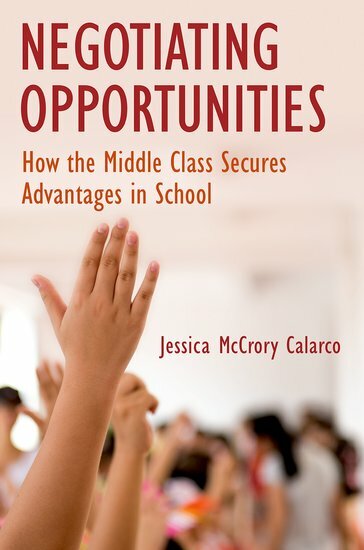 The book, “Negotiating Opportunities” describes how middle-class students – typically those with college-educated professionals for parents – advocate for themselves in the classroom, securing more attention and assistance than their classmates. Working-class students, meanwhile, defer to their teachers, accept consequences when they mess up and often don’t get the help they need. Calarco conducted extensive classroom observations of a cohort of students as they moved from third through fifth grade in a socioeconomically diverse elementary school, then followed up when they were in seventh grade. She also surveyed parents and interviewed students, teachers and parents. The Indianapolis Public Schools board decided this week to ask voters to approve $315 million in increased property taxes to help fund school operations. That may sound like a lot, but spread over eight years and for a district of IPS’ size, it’s a reasonable request. It’s right in line with what school boards have been asking for in other districts around the state. And voters have increasingly approved those school-funding referendums. The IPS operating referendum boils down to $39.4 million per year — about $1,300 per IPS student. Some districts, including West Lafayette, Tri-County and Munster, have won approval for more than that, per pupil. Other districts, including MSD Warren Township and Crown Point, have settled for less. The IPS referendum would increase local property taxes by up to 28 cents per $100 assessed property value. That’s right in the middle of the 16 school operating referendums approved in the past year. Indianapolis Public Schools just went through the difficult and excruciatingly painful process of closing three of the district’s seven high schools. Now the Indianapolis Chamber of Commerce wants it to close more schools as a condition for getting business support for an upcoming school-funding referendum. The chamber made the demand in an analysis of IPS finances that it released last week. The group said it is willing to support a modest tax increase to help fix aging buildings and give teachers and principals a raise, but only if the district agrees to cut nearly $500 million in spending over the next eight years. That’s a huge amount — it’s more than a 15-percent reduction in spending, by my calculation. The chamber report never actually refers to closing schools (except in a footnote); it calls for reducing “excess seats.” But it’s clear that closing schools would produce the bulk of the savings. IPS officials say they would have to close at least 10 elementary or middle schools to make the cuts. The Supreme Court ruled 5-4 last week that it is unconstitutional for public-employee unions to collect fair-share fees — fees charged to non-members to cover the cost of representing them in collective bargaining and other matters. The decision in Janus v. AFSCME was expected but bizarre. The court’s majority, after all, are supposed to be originalists who insist the Constitution means what the framers wrote over 200 years ago. Conservative legal critics are likely to mock the idea, expressed by the late liberal justice William O. Douglas, that “emanations” from the text of the Constitution form a “penumbra” in which other rights – such as a right to privacy – can be found.